As most already know we love all things spicy. I love Cajun pasta but wanted to prepare a lightened up version. 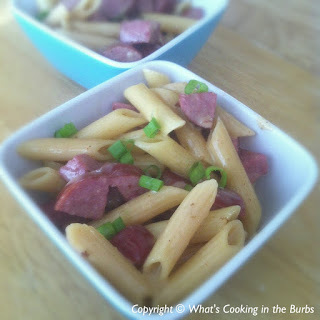 I prepared mine using Penne Pasta and Smoked Turkey Sausage. I am so glad I decided to use the sausage instead of chicken in this dish. It was a fantastic flavor combination. I can't wait to make this one again! Meanwhile, melt the cream cheese in a medium saucepan over medium heat; whisk milk, Cajun seasoning, mustard powder, and cayenne and cook, whisking, 1 minute. Let simmer, stirring occasionally, until slightly thickened, about 5 minutes. Stir in the cheese until melted, then add the pasta and sausage. Season with black pepper and garnish with sliced green onions.